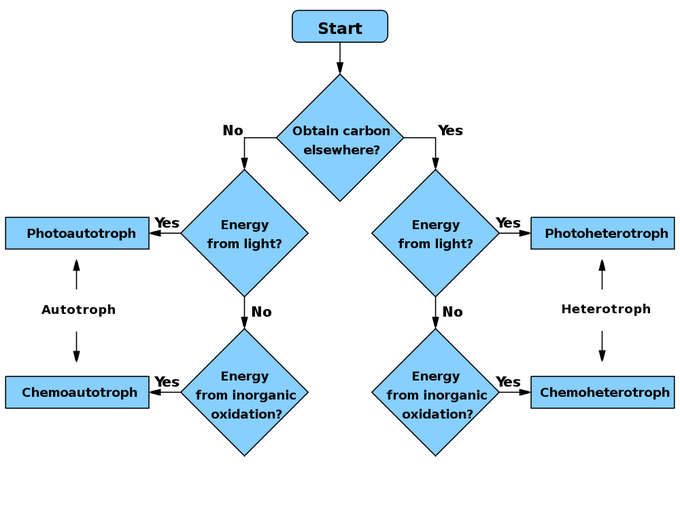 Photoautotrophs and photoheterotrophs are organisms that rely on light as their source of energy to carry out cellular processes. Phototrophs are organisms that carry out photon capture to acquire energy. Photoautotrophs convert inorganic materials into organic materials for use in cellular functions such as biosynthesis and respiration and provide nutrition for many other forms of life. Photoheterotrophs depend on light for their source of energy and mostly organic compounds from the environment for their source of carbon. ATP synthase: an important enzyme that catalyzes the conversion of adenosine diphosphate into adenosine triphosphate. Phototrophs are organisms that use light as their source of energy to produce ATP and carry out various cellular processes. Not all phototrophs are photosynthetic but they all constitute a food source for heterotrophic organisms. All phototrophs either use electron transport chain or direct proton pumping to establish an electro-chemical gradient utilized by ATP synthase to provide molecular energy for the cell. Phototrophs can be of two types based on their metabolism. Types of microbial metabolism: Flowchart summarizing the types of microbial metabolism. An autotroph is an organism able to make its own food. Photoautotrophs are organisms that carry out photosynthesis. Using energy from sunlight, carbon dioxide and water are converted into organic materials to be used in cellular functions such as biosynthesis and respiration. In an ecological context, they provide nutrition for all other forms of life (besides other autotrophs such as chemotrophs ). In terrestrial environments plants are the predominant variety, while aquatic environments include a range of phototrophic organisms such as algae, protists, and bacteria. In photosynthetic bacteria and cyanobacteria that build up carbon dioxide and water into organic cell materials using energy from sunlight, starch is produced as final product. This process is an essential storage form of carbon, which can be used when light conditions are too poor to satisfy the immediate needs of the organism. A heterotroph is an organism that depends on organic matter already produced by other organisms for its nourishment. Photoheterotrophs obtain their energy from sunlight and carbon from organic material and not carbon dioxide. Most of the well-recognized phototrophs are autotrophs, also known as photoautotrophs, and can fix carbon. They can be contrasted with chemotrophs that obtain their energy by the oxidation of electron donors in their environments. Photoheterotrophs produce ATP through photophosphorylation but use environmentally obtained organic compounds to build structures and other bio-molecules. Photoautotrophic organisms are sometimes referred to as holophytic.